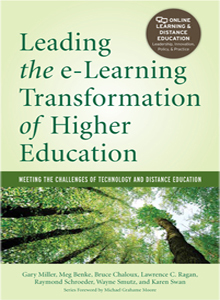 Written by pioneers in the field of online learning, Leading the e-Learning Transformation of Higher Education is a professional text that offers insights and guidance to the rising generation of leaders in the field of higher education. It explains how to integrate online learning into an institution during a period of rapid social and institutional change. This volume launched the new Stylus series that is aimed at the online learning and distance education market. It offers readers the opportunity to benefit from the collective experience and expertise of top leaders in the field. These contributors have helped pave the way and now share their insights, advice, and broad vision with the future leaders of the field. OLC Members – be sure to log in to your account to get your 20% discount on publications. Not a member? OLC Institutional members have full access to the OLC Quality Scorecards Suite, PLUS deep discounts on conferences, workshops and a whole lot more.